You may have heard the term ‘min-max’ thrown around your ops group and perhaps you were afraid to ask what that meant. Essentially, it’s the gamer term of optimizing your character to eek out every single drop of performance you can for your class role. This endeavor can be quite costly in both time and credits but, for those who love to crunch numbers and maximize a character’s potential, it is a passion. I recommend saving your older tier gear in order to rip out any mods that you can use to min-max. You would think that upgraded gear means upgraded stats but that isn’t always the case. Take a look at the example below. 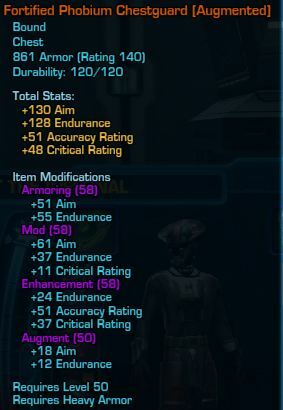 You’ll notice that the Armoring and Mod in the boots are an upgrade but the enhancement for the Rakata piece has 40 End, 51 Acc, and 20 Defense while the Columi has 38 End, 48 Shield, and 19 Defense. 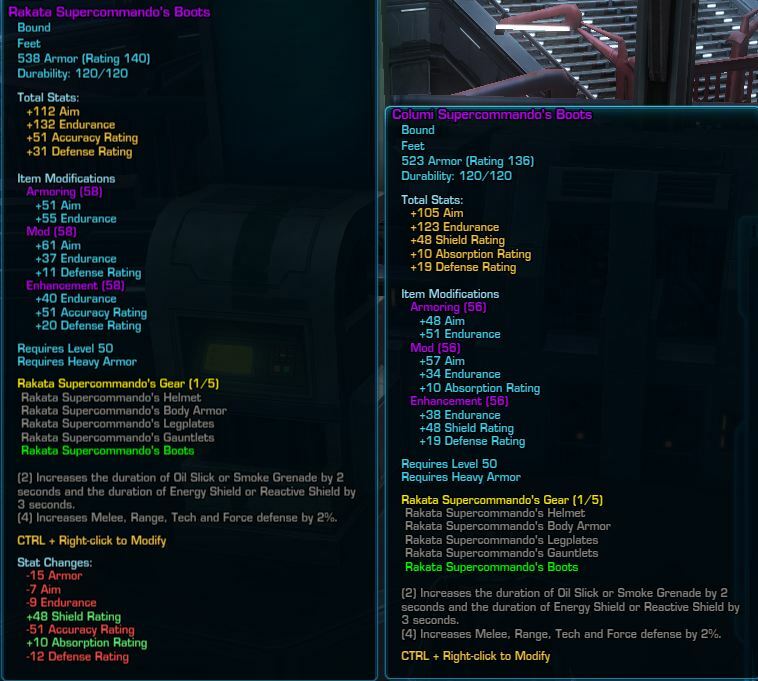 For my offspec tank set, I don’t want the accuracy so changing out the enhancement will allow me to gain 48 Shield while only losing 2 Endurance and 1 Defense. Take a look across all of your gear and see what other pieces you can use this method with. Remember that the Mod and Enhancement modifications can be moved from boots to legs to chest, wherever you want to put it. The Armoring, however, is locked to the particular slot that it came out of. If you are an armortech or synthweaver, you are capable of crafting your own Rakata bracers and waist. Keep making them and eventually you’ll get a critical success which will grant an augment slot. Hopefully, you won’t have to go through too many but min-maxing can get pretty pricey on mats. Those of you who don’t carry these professions can still take advantage. Start shopping around with your friends, guild mates and the GTN for the orange custom gear that have augment slots on them. If you want to keep your tier set bonus, then you can replace one piece. However, if the set bonus for your class isn’t worth keeping, then replace as many as you like. You will gain up to five additional augments slots in addition to the ability to customize your look. PS: Don’t forget you can (and should) do this for your weapons as well. This next bit of customization is a little more troublesome to do, but it may be worth the time, effort and expense if the gains are significant enough. 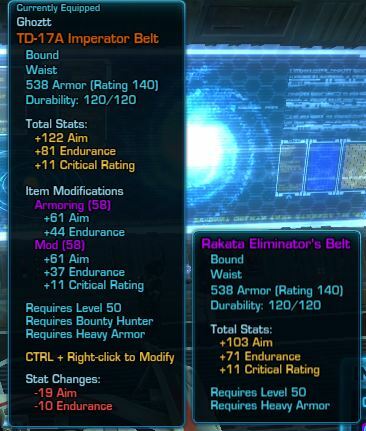 If you are fortunate enough to get your hands on an orange belt (excluding light armor which can be easily bought from the Fleet Comm vendor), then you’ll also need to start shopping for Armoring and Mods that are rank 25. Unfortunately, these mods only drop in hard mode and higher operations so finding them on the GTN will be hit or miss depending on your server’s population and progression. The gains vary from class to class, but as you can see in the example below, it can be a decent upgrade over the Rakata Belt. This little trick can also be done with the orange bracers you buy from the Legacy Vendor, but once again the gains will vary from class to class. This is only the tip of the iceberg of what is a constant process. Players have spent hundreds of thousands of credits just to swap out mods in order to gain a marginal increase in their stats. 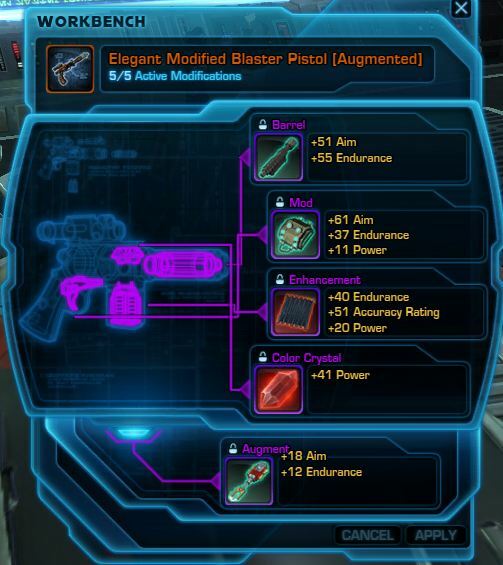 I’ve heard of players who will level their armortech/synthweaving to max in order to get the augmented items only to drop it and re-level biochem to get the items in that profession. There are even some players who will reverse engineer their newly purchased Black Hole gear in hopes of learning the schematic in order to craft the augmented version. The possibilities are only limited to your budget and time constraints, so get out there and start modding!